As motoring costs soar, companies are seeking greener company car fleets. Matthias Lührs, vice-president sales, Mercedes-Benz, explains why its integrated BlueEFFICIENCY range, which delivers sustainable, fuel-efficient and eco-friendly models, is an attractive option. How is Mercedes-Benz's fleet business doing and what are your future plans? Matthias Lührs: The fleet channel is heavily contributing to our sales records. In Europe we have already topped last year, which was our best ever, and we expect to gain almost 60% more large international accounts in 2011 than in 2009. As the new A and B-Class provide excellent CO2 values and a highly attractive design, we expect further growth in 2012. We have dedicated fleet activities in all major markets and, as the economy further globalises, we believe there are substantial opportunities to be found overseas, particularly in emerging markets such as the BRIC countries, South Africa and Australia. It's also equally important to further increase our business in familiar, well-established territories. How does BlueEFFICIENCY work and how compatible is it across Europe? Sustainability and reduced consumption are playing an ever-increasing role in our business. In order to sustainably develop automobiles in an environmentally friendly way, we have committed to an integrated BlueEFFICIENCY strategy. This means that all Mercedes-Benz vehicles are manufactured in a way that preserves natural resources - from planning through to production and recycling. This approach is also reflected in our ground-breaking fuel consumption and CO2 emission-reducing technologies. This includes highly efficient engines such as our diesel-fuelled BlueTEC technology and petrol aggregates; battery-powered electric cars such as the A-Class E-Cell; fuel cell vehicles such as the B-Class F-Cell; and our range of hybrid vehicles - all of which are production-ready and driving on the world's roads today. By the end of this year, 128 BlueEFFICIENCY models will also be available. With such a huge variety of cutting-edge, emission-free vehicles and innovative car-sharing projects such as car2go, we are ideally positioned to address worldwide customer demand. Why should finance directors be interested in BlueEFFICIENCY? For many companies the reduction of vehicle fleets' CO2 emissions is paramount in order to protect the environment and meet legal requirements, particularly in Western Europe where taxation is heavily based on emission levels. Many enterprises also want to play a pioneering role in environmental protection and demonstrate good corporate citizenship. "Mercedes-Benz delivers consistently fuel-efficient vehicles, many of which are best in class in terms of fuel consumption and CO2 emissions." From a financial perspective, lower fuel consumption clearly comes at a lower cost. Therefore, our BlueEFFICIENCY measures are important for fleet owners that are seeking optimum efficiency. From the Smart Fortwo through to the S-Class, we deliver consistently fuel-efficient vehicles, many of which are best in class in terms of fuel consumption and emissions. For instance, the new C220 CDI BlueEFFICIENCY has a mean diesel consumption of 4.4L/100km - 0.4L less than before, which corresponds to 117g/km of CO2. As for other vehicle classes, with an NEDC consumption of 6.0L/100km, 158g/km of CO2 and a range of up to 1,500km on a full tank, the ML 250 BlueTEC 4MATIC offers excellent fuel economy. In the compact vehicle segment, our new B-Class's fuel consumption undercuts its predecessor by up to 21%. The diesel B180 CDI BlueEFFICIENCY now runs on 4.4L/100km and 115g/km of CO2 with automatic transmission. The petrol engine variants B180 and B200 BlueEFFICIENCY now run on 5.9L/100km. In addition, Mercedes-Benz products enjoy the highest value retention in their respective segments. In several recent studies, the CLS and B, C and E-Class were proven to have the lowest value depreciation - making BlueEFFICIENCY models a sound choice in terms of cost-efficiency. We have ambitious future environmental targets. By 2012, our average European fleet will run on less than 140g/km of CO2, and by 2016 we will slash this to 125g/km. This can only be achieved with innovative technologies, particularly on the powertrain side, and we are ready to face this challenge. 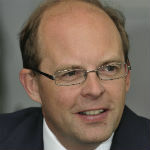 Matthias Lührs, vice-president sales, Mercedes-Benz.